earn­ing to give: earn­ing more so you can donate more, us­ing this money to fund things you think are re­ally im­por­tant. di­rect work: spend­ing your work­ing time do­ing some­thing use­ful, not me­di­ated by money. build­ing ca­reer cap­i­tal: do­ing some­thing that isn’t valuable for it­self, doesn’t make you much money that you can donate, but is fo­cused on prepar­ing you for fu­ture di­rect work or earn­ing to give. For ex­am­ple, my work­ing as a pro­gram­mer so I can donate money is earn­ing to give, while when I was briefly work­ing full time as an in­de­pen­dent re­searcher that was di­rect work. My time in school was pri­mar­ily about build­ing ca­reer cap­i­tal, though I wasn’t think­ing about things in an EA way at that point. I’ve been think­ing about how these choices in­ter­act with pay­ing for col­lege for your kids, and es­pe­cially the fi­nan­cial aid sys­tem. Fancy col­leges use a very pow­er­ful sys­tem of price dis­crim­i­na­tion. They set their price very high, but don’t ex­pect most peo­ple to pay the sticker price. In­stead they have a fi­nan­cial aid sys­tem where they col­lect as much in­for­ma­tion as pos­si­ble about each fam­ily’s fi­nan­cial situ­a­tion, es­ti­mate the most the fam­ily would be able to pay, and then charge that. About twenty top schools are rich enough to charge ex­actly what they think you can af­ford (meet 100% of demon­strated fi­nan­cial need with­out loans), while about an­other ~10 will do this for fam­i­lies with in­come un­der a thresh­old, and an­other ~45 will in­clude stu­dent loans in the price (meet 100% of demon­strated need, with loans). Here’s a list of these schools. If you don’t have so much in­come or as­sets that the col­lege will ex­pect you to pay the full amount, you can think of these as a 100% tax on your post-tax in­come: earn­ing $1 more means the col­lege will charge $1 more. This pushes very hard in fa­vor of di­rect work over earn­ing to give. If I earn $200k af­ter tax and donate $150k, the school still sees that $150k as money I could pay them. Even though I only took the high earn­ing job so I could give the money away, that’s not how the school would see it. On the other hand, if I took a di­rect work job pay­ing $50k af­ter tax I would be in a similar place in terms of effec­tive in­come, but the school doesn’t make a claim on the in­come I’m pass­ing up. 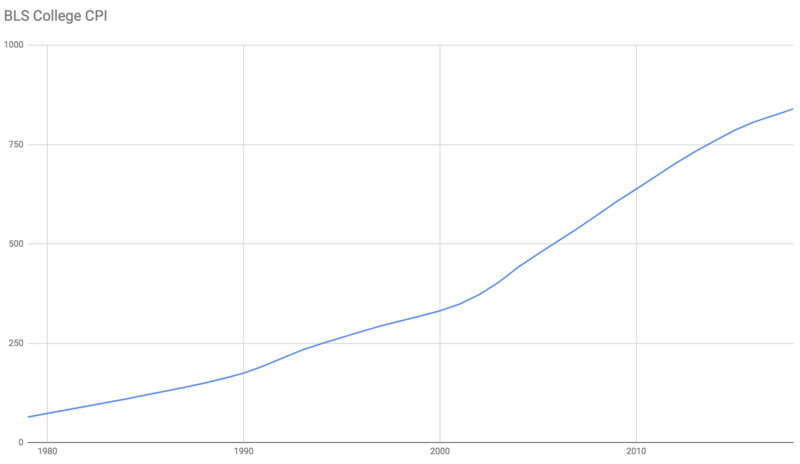 Look­ing at that chart, the main thing that comes to mind is to won­der what changed in the early 1980s? Why did costs sud­denly move from in­creas­ing at about the same rate as in­fla­tion to in­creas­ing so much faster? I’ve read some things sug­gest­ing this is col­leges hiring many more ad­minis­tra­tors, but I’d be re­ally cu­ri­ous to read more if peo­ple know what’s hap­pen­ing here? 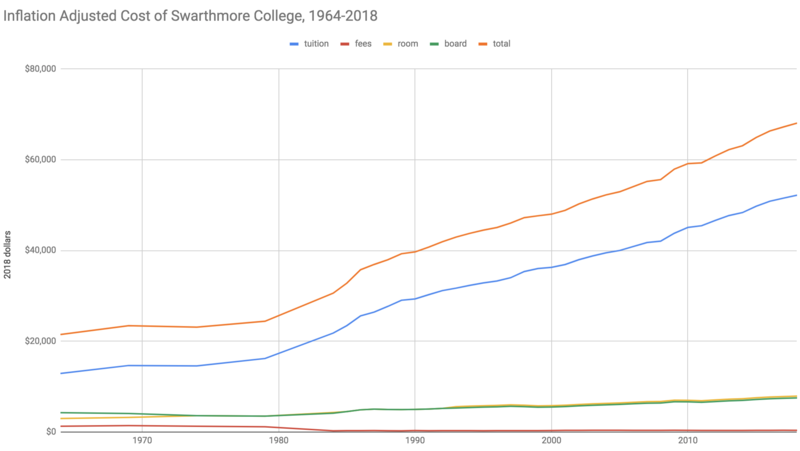 I’d also love to see two similar charts, one show­ing the amount stu­dents ac­tu­ally pay, af­ter fi­nan­cial aid, and the other show­ing col­lege ex­penses per-cap­ita, since fundrais­ing is also a large source of col­lege in­come. This would give es­ti­mates, still in 2018 dol­lars, of $82k for when a now-four year old starts col­lege, and $87k when a now-two year old finishes. This is graph­ing the BLS Col­lege Tuition and Fees con­sumer price in­dex, which tries to track the cost of col­lege. This shows col­lege cost ris­ing much faster than above, be­cause it isn’t ad­justed for over­all in­fla­tion. What if we ad­just this for in­fla­tion, the same way we would con­vert past dol­lars to pre­sent dol­lars? 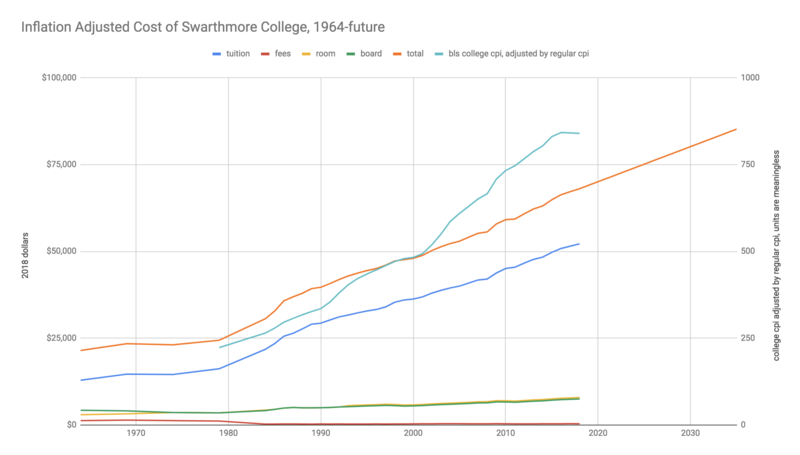 If Swarth­more’s costs had grown at that rate it would have moved from $16k in 1986 ($36k in 2018 dol­lars) to $101k in to­day, in­stead of the $68k we ac­tu­ally see. That’s 2.8x in­stead of 1.9x. 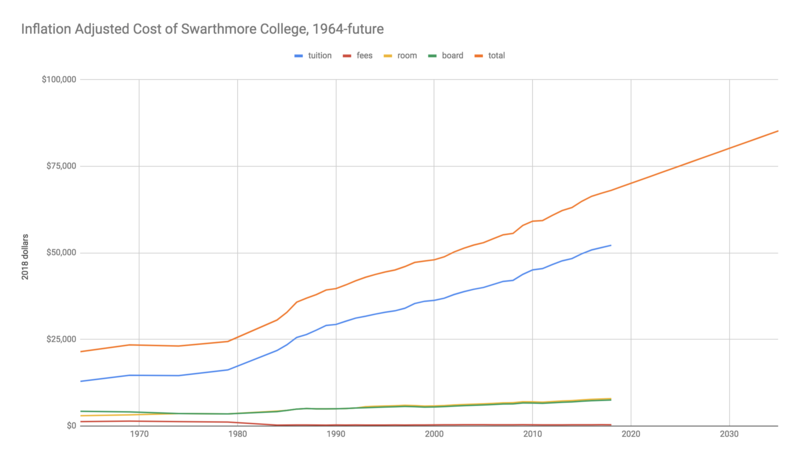 I think what’s go­ing on is that Swarth­more was already a very ex­pen­sive place, while most of the schools in the CPI started off much cheaper. While I haven’t looked at num­bers for the other schools at the top of the price range, I’m pretty sure I’d see the same thing: large cost in­creases, but not as fast as the col­lege CPI. Are there other fac­tors af­fect­ing cost? For the most ex­pen­sive schools, with their fi­nan­cial aid-as­sisted price dis­crim­i­na­tion I think there’s not much of a down­side to con­tin­u­ing to in­crease the offi­cial price. A larger and larger frac­tion of peo­ple will be on fi­nan­cial aid but, since these schools are care­ful not to charge more than the fam­i­lies can pay, higher prices prob­a­bly don’t end up turn­ing peo­ple away. I’m not sure what keeps the col­leges from rais­ing their prices even faster, but my guess is that they want to avoid look­ing greedy. This makes me think $80-90k/​year in 2018 dol­lars is a pretty good guess for schools at the up­per end of the price range in the 2030s. Now, there are lots of other ways things could change by the 2030s. Col­lege could lose its rele­vance as top em­ploy­ers start re­cruit­ing promis­ing high school stu­dents. The idea that ev­ery­one should go to col­lege could fade for some other rea­son. Col­leges could be “dis­rupted” by some­thing else that can fill a similar role in a much cheaper way. Or col­leges could be­come even more cen­tral, even more com­pet­i­tive, even more able to use high sticker prices as ev­i­dence of the value they provide, fi­nan­cial aid loses its re­main­ing stigma, and sticker prices could rise faster. Or there could be some kind of col­lapse or dis­rup­tion, where this all looks very differ­ent. I’m go­ing to try look­ing ahead as­sum­ing stuff doesn’t change, but also avoid giv­ing recom­men­da­tions too tied to the cur­rent way things work. First, whether this is worth car­ing about at all de­pends on how much money you’re mak­ing. If your in­come is $1M/​year, you prob­a­bly do well to con­tinue earn­ing to give even if col­leges are tak­ing $85k. On the other hand, if I’m mak­ing closer to $300k then af­ter taxes and col­lege there would be very lit­tle left to donate. It’s very hard to pre­dict how the mar­ket for soft­ware en­g­ineers will look that far out, and I think there’s a de­cent chance my in­come will fall sub­stan­tially, but I’ll keep go­ing as­sum­ing it stays in this range. So even if I’m a much bet­ter fit for earn­ing to give than di­rect work, I might want to move out of earn­ing to give when my kids are get­ting close to start­ing col­lege. Be­cause col­leges look at ~2 past years in­come when mak­ing cur­rent aid de­ter­mi­na­tions, this tran­si­tion would need to hap­pen a few years early. Closer to the time I’d want to look into aid de­ter­mi­na­tions again, to make sure I didn’t stick with earn­ing to give too long. I’m guess­ing my two kids will be in col­lege for a com­bined six year span, so this would mean at least eight years away from earn­ing to give. One con­sid­er­a­tion is whether I’d be able to move back into this af­ter be­ing away for so long. It might be worth hav­ing six years of not be­ing able to donate 50% in ex­change for the years af­ter be­ing much more pro­duc­tive. I think this de­pends a lot on what I do in the in­ter­ven­ing time. For ex­am­ple, if my di­rect work were in tech of some kind I’d still be get­ting rele­vant prac­tice, whereas if I did this as more of a ca­reer change it would make more sense if it wasn’t some­thing I would be switch­ing back from. Another pos­si­bil­ity is that I could con­tinue earn­ing to give, and our kids could go to a cheaper school. I don’t know what that’s likely to look like in the 2030s, but if I were de­cid­ing this to­day my guess is that it’s worth it for our kids long term to go to the best school they can get into. It doesn’t take very many years of higher in­come alone to make up the differ­ence. I also looked some into the best ways for par­ents to save money if their kids would be get­ting fi­nan­cial aid. While I pre­vi­ously sug­gested stu­dents get mar­ried so their par­ents’ fi­nances wouldn’t be con­sid­ered, schools that do this kind of price dis­crim­i­na­tion re­quest the CSS Pro­file in ad­di­tion to the FAFSA, which does in­clude fi­nances for par­ents of mar­ried stu­dents. De­tails of how this works are likely to change, but it looks like re­tire­ment ac­counts are pretty much the only place you can re­li­ably put money and not be ex­pected to use it to pay for your kids’ col­lege. Re­tire­ment early with­drawal is a 10% penalty, and schools typ­i­cally take 5% of as­sets per year, so it makes sense to put money into re­tire­ment ac­counts even if you think you might need it be­fore you re­tire. It looks like sav­ing money for col­lege in a 529 plan, es­pe­cially one in the stu­dent’s name, is not a good idea. The more you save the less fi­nan­cial aid you get, though not with at high a rate as with in­come: the CSS Pro­file cur­rently figures 5% (per year) for parental as­sets and 25% for stu­dent as­sets. Col­lege is still a long way off, with my kids yet to start kinder­garten, so it looks like the only two take-aways right now are that it’s not use­ful to safe ex­plic­itly for col­lege and that re­tire­ment sav­ings ac­counts are good. Look for an up­date some time around 2028. I en­joyed this very much. Look for an up­date some time around 2028. I would love to see a pa­per ac­tu­ally break­ing out how all the rea­sons why col­lege has got­ten so much more ex­pen­sive ac­tu­ally con­tribute quan­ti­ta­tively, but I have not seen it yet. 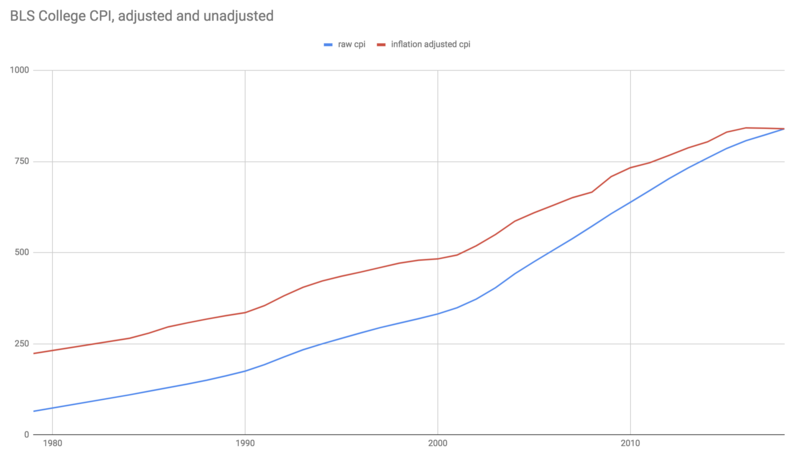 In gen­eral, we ex­pect some­thing that is la­bor dom­i­nated to in­crease faster than in­fla­tion, be­cause salaries in­crease faster than in­fla­tion (this is roughly per cap­ita eco­nomic growth). But col­lege has in­creased faster than per cap­ita in­come. You men­tion more ad­minis­tra­tors. Also, there are more ser­vices, like ca­reer ser­vices. You point out that tu­ition has in­creased faster than the amount ac­tu­ally paid, be­cause there is more price dis­crim­i­na­tion. There is also re­duced state fund­ing for state col­leges (I be­lieve ab­solute and definitely as a per­centage). There may be re­duc­tion in mean class sizes-there has been for pri­mary and sec­ondary. There is more tech­nol­ogy use in­side and out­side the class­room—over­all I think this has in­creased effi­ciency, but it would still prob­a­bly show up as an in­crease in tu­ition. On the side for con­trol­ling costs, a much greater pro­por­tion of classes are taught by low-paid ad­juncts. Also, terms have got­ten shorter. Another fac­tor that can con­trol costs is en­dow­ments. Prince­ton has ac­tu­ally re­duced its tu­ition re­cently be­cause its en­dow­ment is so big. Or let them pay for their own col­lege. The rates they’ll get charged will take your in­come into ac­count, so they’ll have to get a lot of loans. But the loans are pretty man­age­able and es­sen­tially risk-free as long as in­come-based re­pay­ment re­mains an op­tion. Now, if they are com­mit­ted EAs and will be earn­ing to give, this doesn’t ac­com­plish as much since this comes out of their fu­ture earn­ings. But even if there’s a 95% prob­a­bil­ity that they turn out to be earn­ing to give as EAs, that’s still bet­ter than the ~100% odds with re­spect to you. And the in­ter­est rates on those loans are lower than av­er­age stock mar­ket re­turns, so the smart fi­nan­cial move is always to get the loans and pay them off as slowly as pos­si­ble rather than pay higher up front costs (as­sum­ing they’re rea­son­ably risk tol­er­ant, as young peo­ple should be but es­pe­cially when the goal is to max­i­mize good done rather than max­i­mize their own com­fort) (this is a lit­tle more com­pli­cated to see when we’re talk­ing about earn­ing to give. but you must be as­sum­ing a larger dis­count rate for the value of dona­tions than what you could earn by in­vest­ing and giv­ing later; oth­er­wise you’d be do­ing that in­stead of giv­ing now. So if giv­ing the money away now is worth sac­ri­fic­ing the ~10% an­nual gains you could make on it, then it’s even more worth sac­ri­fic­ing ~7%/​year in in­ter­est pay­ments).